Dave practices physical therapy at the UW Health Rehabilitation Clinic in Middleton. His area of practice is in neuro rehabilitation, working with people with a variety of neurological conditions such as stroke, spinal cord injury, Parkinson's disease, traumatic brain injury, multiple sclerosis and stroke. He has a special interest in the area of vestibular rehabilitation. 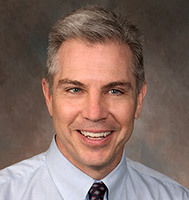 Dave holds a Master’s of Physical Therapy degree from the University of Iowa, Iowa City, IA, and maintains a competency-based certification in the area of Vestibular Rehabilitation.